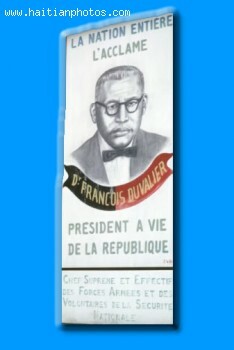 Is Michel Martelly a "Papa bon ke" or modern version of the Duvalier regime? 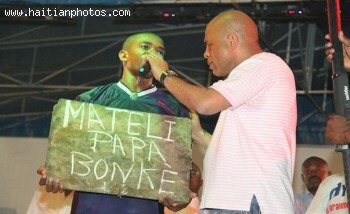 Looking at President Michel Martelly distributing gifts to those who could not afford to is truly a good thing. The president has been able to make Christmas for many families a little brighter. Many received gifts such as toys for the children, envelops with cash, motorcycles and even brand new cars for a few who were the luckiest. I know this is good and specially at the end of the year it is probably a good thing to do for the people who have been through so much. 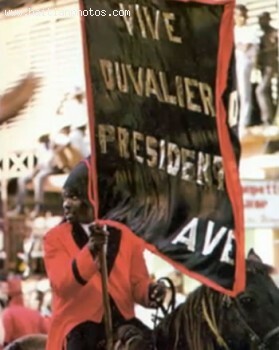 Too many people in Haiti had to deal with so many bad situation for at least the past two years; namely. the 2010 earthquake, Cholera, poverty, insecurity, health issues, and much more. Having said all that, looking at these pictures where President Michel Martelly is handing cash, toys, money to the Haitian population, I can not help it but to feel like a sense of "Deja Vue"
"Michel Martelly "Papa Bon Ke"
"Mateli Prezidan A Vie Tet Kale"
"Matelli Papa Bon Ke Ki Vin Sove Ayiti"
"Vive Duvalier, President A Vie"
"La nation Entiere Acclame Francois Duvalier, President A Vie de La Republique"
"Vouloire Detruire Duvalier C'Est Vouloire Detruire Haiti"
Do you remember the time when Francois Jean Claude Duvalier were throwing money on the street to the crowd? Were you OK with that? To me, the only difference now is that instead of throwing the money and have the population fight for it, the money is put in an envelop. Where does this money come from to begin with? did the money come from "Papa Bon Ke" own pocket or was it taken from funding collected through taxes or provided by the international community? Did we hire a president to work on solving the many problems we have in Haiti or did we elect a god? I think the money could have been used for better things. Instead of giving money we do not have and create the ongoing dependency in the Haitian population, this money could have been used to create more employment so that next year less people would want a hand out from their government. Should such a practice be allowed in a democratic society? If a president can do this, then there is no longer a need to do election. The current president can continue to give people cash from from the Public Treasury and let the population continue to call them "papa Bon Ke"
President, please show the Haitians how to fish. Stop giving them the fish. Are you OK with the practice of using Public fund to do end of the year giveaway? Do you agree with the president? Je pense que ce n'est pas une mauvaise chose. Avant de critiquer mettez-vous dans la position de ceux-la qui le recoivent. Dans tous les pays du monde on le fait. Supporter les plus faibles c'est juste et droite. Et surtout c'est pour une occasion speciale. On ne peut pas le faire toute l'annee. Le gouvernement american envoit des stimulus packages (money) a la population. Personne ne dit rien negativement. je n'ai absolument rien contre le president Michel Martelly mais, je pense qu'au lieu de donner de l'argent au peuple, il faut plutot generer de nouveaux postes d'emplois.Pwoveb la di: "si ou banm yon poison ma mange yon jou mmen si ou montre'm peche ma mange chak jou"
social work should be orgonized. Vous les opposants, vous etes toujours contre que l'action posee est negative ou positive. Vous avez apprecie par contre les gouvernements passes qui ont tout vole le revenu du pays et n'ont rien donne aux pauvres seulement achete des Villas pour leurs familles et amis en Haiti et a l'etranger. Cessez d'etre un opposant mais un journaliste. May be you are those who think whatever the president does is all right. Can the president uses the public treasure as he wants. If you cannot give to all don't give at all. Those practices need to stop, in a democratic society this is considered as bribery. Only in a banana republic such things are allowed. Mwen pa swete pesonn komante negativman sou ansanm jes sa yo ke Michel ap fe ak popilasyon an. 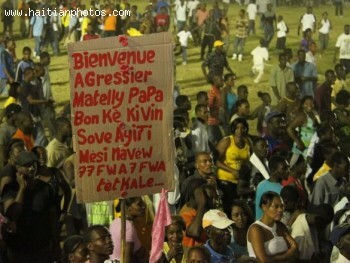 Ann di pito Bon kouraj ak Michel AMrtelly pandan nap di l tou pou l pa janm bliye ki misyon li genyen pou Ayiti. Paske Nasyon an chwazi l nan yon moman ke yo gen anpil bezwen ki nesese. Ann aprann ankouraje moun pou sa l fe ki bon pandan nap pwopoze l de bagay ki pi bon epi pi efikas toujou pou byenet nasyon an.